Serves 4 as lunch or light supper. 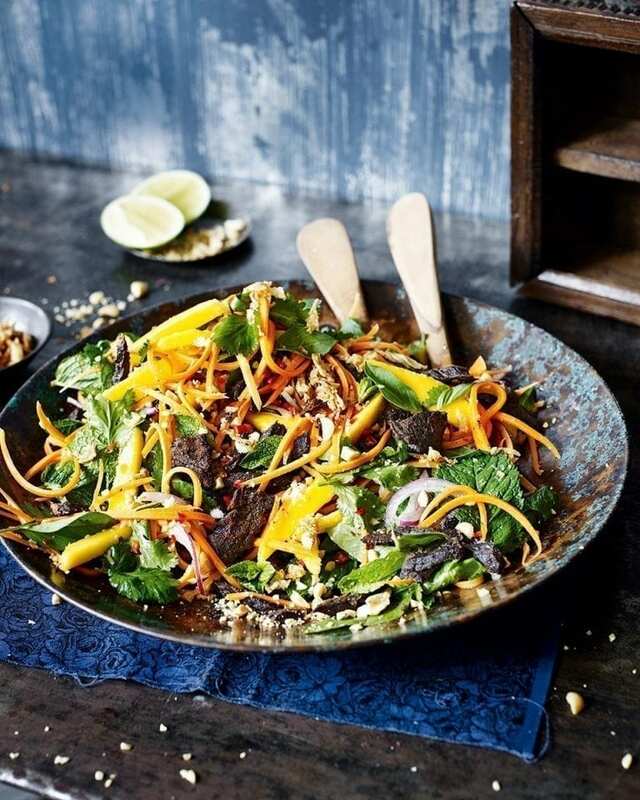 Transport yourself to Vietnam with every bite of this spicy beef salad. The sweetness from the mango and the crunch from the carrots help combat the heat from the marinade. Mix all the marinade ingredients in a large bowl, then add the beef, turning it until well coated. Cover the bowl with cling film and chill for 12-24 hours, or overnight, turning occasionally. Once the beef has marinated, heat the oven to 130°C/110°C fan/gas ½. Lay the beef strips on a large baking tray lined with baking paper, then bake for 3 hours, turning a couple of times. Don’t worry if they look wizened and dry – they’re supposed to! Set aside to cool. For the dressing, put the fish sauce, rice vinegar, sugar and 3 tbsp water into a small saucepan and heat gently until steaming and the sugar has dissolved. When this happens, remove from the heat and stir through the lime juice, chilli and garlic, then leave to cool. Once the beef is cool enough to handle, shred it with your hands, then toss in a bowl with the mangoes, carrots, red onion, half the peanuts and most of the herbs. Pour over half the dressing and toss together. Tip onto a platter, scatter with the remaining herbs and peanuts and the crispy onions, then drizzle over the remaining dressing. Serve immediately. This dish is meant to be spicy but if you’d prefer it less hot, reduce the chilli flakes, use mild chilli powder, or leave out the chilli. Use a very sharp knife to slice the beef along the grain (opposite to how you’d carve it), or it won’t shred when cooked. The cooked beef will keep, covered, in the fridge for up to 4 days. Bring back to room temperature before shredding.